You can expect all of the same benefits and features of the Teryx 750 4×4, along with dashboard cup holders, a sun top and half windsheild from the LE model. Feature-packed and ready for fun in almost any setting, the Kawasaki Teryx™ 750 FI 4×4 LE takes the next evolutionary step with the addition of digital fuel injection. This deluxe Recreation Utility Vehicle (RUV) features all the fun-loving performance and utility of a standard 750 FI 4×4, but adds handy standard features like a half-windscreen, cab roof, retractable cup holder and painted bodywork. The fuel injection system’s sophisticated array of sensors includes an inlet air pressure, throttle position, crankshaft position, rpm, water temperature and a vehicle down sensor. As part of the DFI upgrade, the Teryx 750 FI 4×4 LE also received a new fuel tank with an internal fuel pump. Power is nothing without control — big power demands a chassis to compliment it and once again the Teryx delivers with an ideal body width that is narrow enough to be useful and able to navigate most trails, yet wide enough to offer a roomy cab and additional stability. The wide track Teryx 750 FI 4×4 LE design exploits a large-diameter, thin-walled tubular frame offering the necessary rigidity without performance draining weight. It also meets SAE regulations as a roll-over protective structure (ROPS) with an arrangement spacious enough to comfortably fit two full-sized adults. The Teryx 750 FI 4×4 LE shares the long A-arm and narrow frame concept of its sport brethren to give it the maximum travel while minimizing wheel camber change. For 2009, the adjustable Kayaba gas-charged shocks have revised settings combined with a new stabilizer bar to improve ride quality. Combined with the mid-ship engine, the balanced package offers superb control and cornering performance, even at top speed. A powerful RUV wouldn’t be much fun without equally capable stopping power and Teryx 750 FI 4×4 LE delivers. It employs a combination of dual 200mm discs up front and a sealed wet brake in the rear. The front brakes are tucked into the wheels for protection from debris and their 27mm twin-piston calipers are rigid-mounted for optimum feel and control. The advantage of the sealed rear brake is most apparent when it’s able to keep working even in the wettest or muddiest of environments. Its compact profile further adds to the remarkable amount of ground clearance. Of course, this substantial performance is matched by Kawasaki’s legendary durability and reliability that starts on the surface – tough scratch resistant Thermo-Plastic Olefin (TPO) bodywork, that is. Skid plates help shield the Teryx engine and undercarriage from the ride stopping obstacles. For the trip to and from the ride spot, the LE sports a strengthened roof to resist wind gusts when transporting at highway speeds. Inside, bucket seats and retractable three-point seat belts help the driver and passenger stay relaxed; the Teryx 750 FI 4×4 LE has plenty of shoulder and leg room to provide a comfortable ride. Rider comfort and conveniences are enhanced with a half-windshield and dual retractable cup holders. It also has a steering wheel that is positioned low for better driver control. Standard equipment on all Teryx models, the multi-function digital meter adds a fuel gauge and parking brake indicator to the hour meter, clock, odometer, dual trip meters and warning lights. 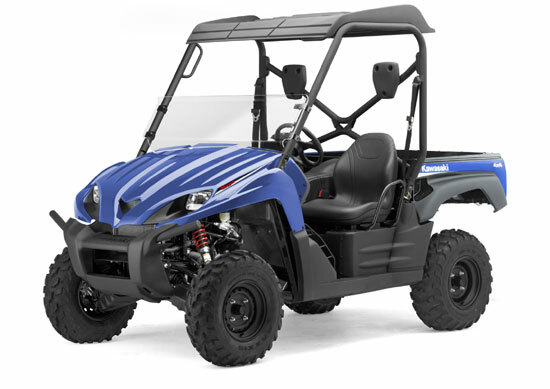 Don’t mistake the Teryx 750 FI 4×4 LE for just a player. It has working skills too. Its standard 500-pound capacity, gas-assisted tilting cargo bed is ideal for recreational users, yet versatile enough for work and hauling. A cargo net and tie down hooks in all four corners keep the goods secure. Its 1300-pound towing capacity expands those cargo abilities further. A large selection of authentic Kawasaki Accessories are available for the 2009 Teryx 750 FI 4×4 LE through Kawasaki dealers. As with all off-highway vehicle recreation, Kawasaki encourages RUV drivers to drive responsibly and to respect the environment.